In collaboration with Bill Viola and the Bill Viola Studio, Fire Woman and Tristan's Ascension is being presented on a 22-foot high screen inside a space completely closed off from the outside and together with a 4.1 sound system, enveloping the viewer in a transformative experience. These installations, on loan courtesy of Bill Viola Studio, were created in 2005 as part of a new production by Peter Sellars of Richard Wagner’s opera Tristan and Isolde. Lio Malca chose these works carefully. He notes: «I have always been a great admirer of Bill Viola’s work. From the first moment I entered La Nave, I have always visualized that one day his work would be projected on a large scale. This year that dream will become a reality; two of the most important works by the master Viola will be shown in Ibiza.». 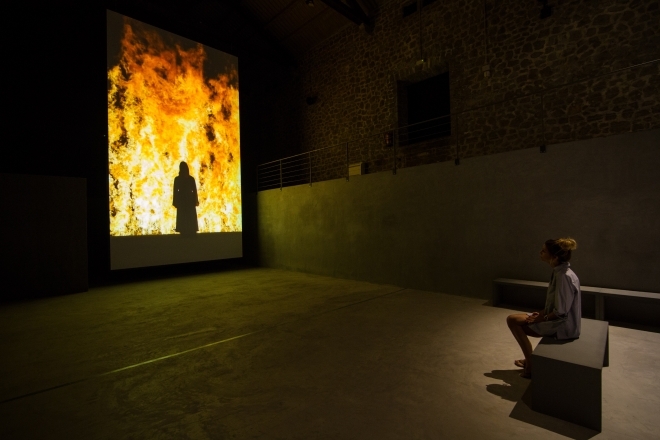 Bill Viola describes his works: Fire Woman is an image seen in the mind’s eye of a dying man. The darkened silhouette of a female figure stands before a wall of flame. After several minutes, she moves forward, opens her arms, and falls into her own reflection. When the flames of passion and fever finally engulf the inner eye, and the realization that desire’s body will never again be met blinds the seer, the reflecting surface is shattered and collapses into its essential form—undulating wave patterns of pure light. Tristan’s Ascension describes the ascent of the soul in the space after death as it is awakened and drawn up in a backwards-flowing waterfall. The body of a man is seen lying on a stone slab in an empty concrete room. Small drips of water become visible as they leave the ground and fall upward into space. What starts as a light rain soon becomes a roaring deluge, and the cascading water jostles the man’s limp body and soon brings him to life. His arms move of their own accord and his torso arches upward amidst the churning water. Finally, his entire body rises off the slab and is drawn up with the rushing water, disappearing above. The torrent of water gradually subsides, and the drips decrease until only the empty slab remains, glistening on the wet ground. The image sequence is projected onto a tall, vertically oriented screen mounted on the wall. Bill Viola (New York, 1951) is a fundamental artist in the contemporary art world. His works have been exhibited in many museums around the world. He has received numerous recognitions throughout his career, such as the prestigious MacArthur Foundation Fellowship (1989) and elected Honorary Member of the Royal Academy of Art, London (2017). Influenced by artists such as Joseph Beuys, Nam June Paik, and Bruce Nauman, Bill Viola approached the emerging universe of video art in the 70s after graduating in Fine Arts from the University of Syracuse. A decade later, he was already one of the leading names in the international art scene for his new electronic and audiovisual media. His work revolves around universal themes such as birth, death, life and transformation that reveal his interests in mystical experiences, especially with Zen philosophy, Christian mysticism and Sufism. Medieval and Renaissance art are also aesthetically present in his work, which often shows a pictorial quality in which sound and music are an essential part of the artistic experience. Viola uses technology to address deep issues and inherent conditions of humanity with different examples of duality. Life and death, light and darkness, action and calm, strength and tranquility are constant themes in his work. Works that come from a world that is part of the invisible, a place of interior landscapes, landscapes where time extends to the infinite, where the subtle changes of light create an eternity and where the sound extends beyond the ear. Viola creates a space for meditation, contemplation and, perhaps, even epiphany. That's why, as Bill Viola recognizes, «the most important place where my work exists is not in museums or in the screening rooms or on TV or even on the video screen. My work exists in the mind of the viewer who has seen it».